However I actually have purchased one in years and I can’t say it’s been missed. This little tee caught my eye, mostly the little heart on the sleeve caught my eye…I love little details like that. I also loved the fact that it’s embroidered, it makes it feel a bit more expensive. I don’t think graphic tees will be making any sort of comeback in my wardrobe, but it is nice to switch things up. Hope everyone is having a wonderful Thursday…it’s almost the weekend! Its funny how our tastes change over time. For a while I only purchased tees for weekend chores, however lately I have been more drawn to them for daily wear. I love a good graphic tee! I love how you paired this one with otk boots! Perfect! That tee is the cutest!! I want one! I actually haven't purchased a graphic tee in a really long time either. That being said, I love this one! That heart on the sleeve really makes it cute. I also love your boots! Loving this look babe! I love the denim and the OTK boots! What a perfect look! I wouldn't change a thing about it. So fab, lady!! 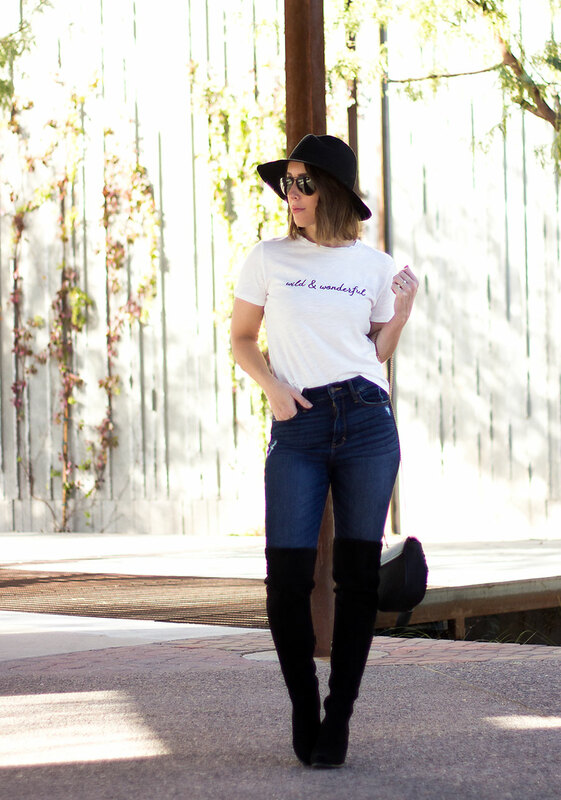 I love a subtle and cool graphic tee and this is a great one! Love the heart on the sleeve of this tee. Your boots and hat really complete the look! 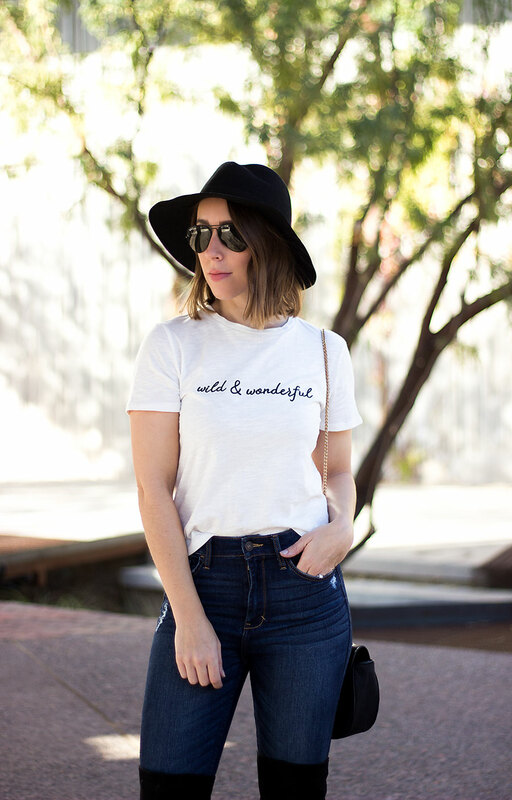 I love how simple and darling this tee is! I love how you dressed it up with that floppy hat! That bag is just amazing!!! Love this!! This tee is so adorable! Loving how you styled it! Such a cute look! 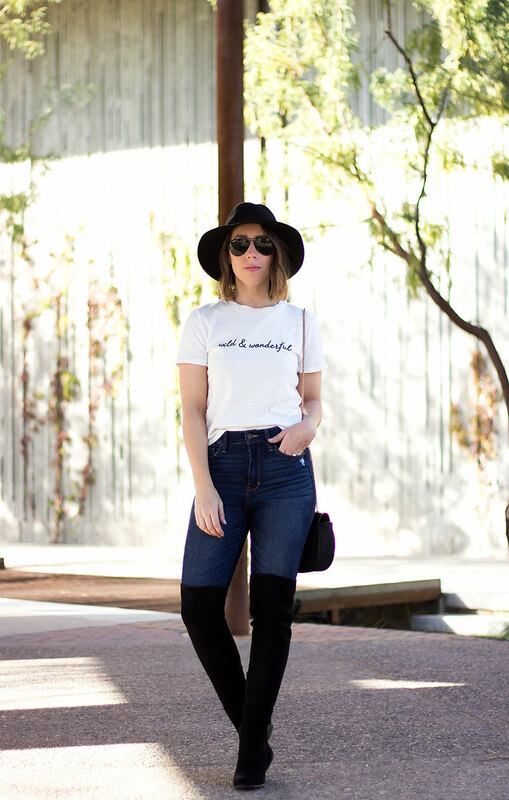 I love how you styled that fun graphic tee! You look so cute! I love that tee! Great outfit! It says it all without saying too much:-). And those boots! That hat is just amazing. I love how you paired this one with boots.